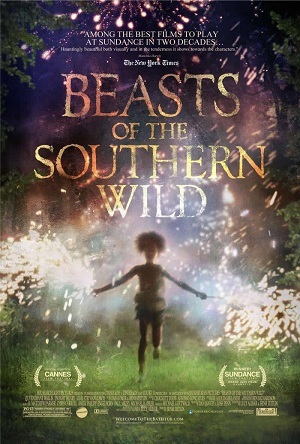 Beasts of the Southern World tells the story of Hushpuppy (Quvenzhané Wallis), who lives with her father, Wink (Dwight Henry) in a bayou community called Bathtub on the Gulf Coast. Wink, who has a terminal blood disease, is a stern father who wants Hushpuppy to be able to live on her own after he dies. A hurricane comes, and their home is engulfed by water. They and other residents of Bathtub then live in a house built on high stilts. They eventually succeed in blowing up a levee that is keeping the flood waters from draining away. Emergency personnel then show up and take them to a shelter. They eventually escape and return to Bathtub. Wink’s illness gets worse, and he appears to be dying. Hushpuppy and some friends then swim towards a light over the ocean, which Hushpuppy believes is where her mother is at. The performances of Quvenzhané Wallis and Dwight Henry are what carry this film. They are so strong and so interesting to watch that you can almost overlook the coyness of the story. Of the various fantasy elements in this film, the one I found most annoying was some business about antarctic ice melting and releasing aurochses that then chase Hushpuppy. (The aurochses are depicted as looking like gigantic wild boars. They were actually the ancestors of modern cattle.) This struck me as nothing more than a destraction from the main story. When I first came here [Louisiana] a year after the storm, it was a totally surreal place,” says Zeitlin, who credits the phantasmagoric films of Emir Kusturica with inspiring him to become a filmmaker. “It seemed just like Biblical apocalypse, and whether or not that was every individual experience, it was important to me to kind of elevate the story, as I did with Glory, to the level of a myth or a folktale. Look, the politics of any event is always incredibly divisive: ‘It was all Bush’s fault.’ Or: ‘It was the local government.’ Black people. White people. None of which actually gets at the real tragedy or the real emotion of the event. To me, that’s sort of the purpose of myth and folklore, to be able to talk as an entire culture about something. So we have the story of the West, and there’s this cowboy, and we can revise the story of the cowboy depending on how we want to interpret our culture. I’m not keen on this whole idea of creating “myths”. First of all, it shows a misunderstanding of the function that myths serve in primitive societies. Myths are a way for people to try to understand the world. Beasts of the Southern Wild is amusing to watch, but it doesn’t in any way help us to understand Hurricane Katrina. What’s more, this idea of “myths” seems to me to be a way of avoiding dealing with complex and possibly unpleasant topics. Moreover, I don’t understand Zeitlin’s aversion to the idea of assigning blame for the destruction of New Orleans. His argument smacks of that hippy-dippy-feel-good-kumbaya philosophy that forbids the idea of judging other people, which is the most pernicious legacy of the 1960’s counterculture. Zeitlin shows talent as a director. I just wish he would drop this “myth” nonsense. This entry was posted on August 7, 2012 at 7:36 am and is filed under 1960's, Cinema, Gulf Coast, Hurricane Katrina, Louidiana. You can follow any responses to this entry through the RSS 2.0 feed. You can leave a response, or trackback from your own site.